From the town of Jenner, go north about 21 miles to the intersection of Kruse Ranch Rd. Turn east and go about 1 mile to park entrance. Today, this pristine reserve contains second-growth redwood, Douglas-fir, grand firs, tanoaks, and a plethora of rhododendrons. Each May these spectacular flowers burst into bloom, coloring the deep green of the forest with brilliant pink blossoms. More than two miles of hiking trails wind through the quiet forest with a short loop trail that leads through clusters of rhododendrons. Ferns carpet the canyons where seasonal streams abound. In addition to the rhododendrons, other understory plants include salals, pacific wax myrtle, and California Huckleberry. Please remain on the trails so that the young plants may flourish. The wealth of rhododendrons in this reserve is a direct result of normal plant succession patterns following a severe fire that once occurred here. Today, the regenerating forest is gradually overwhelming the rhododendrons. As forests constantly evolve, plants compete for available sunlight, water and nutrients and the best suited species dominate the environment until they create conditions more conducive to the success of other plant populations. In order to maintain fine displays of rhododendron blooms, the current plant succession must be slowed, which is the goal of in its management of the reserve. To achieve this goal, the tanoak trees have been thinned out and the rhododendrons revived with the renewal pruning practices. This has ensured vigorous new growth and a diversity of blooming heights. When the rejuvenation project began during the fall of 1979, there were few blooms, and those that did appear were all well above eye level. 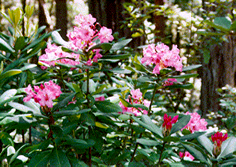 Tanoaks were crowding out the rhododendrons by successfully competing for available sunlight, resulting in rangy growth habits of the rhododendrons. Final major pruning occurred in the fall of 1981. By 1984 a significant increase in the floral displays was evident. To reach the reserve, travel twenty miles north of the town of Jenner. The reserve is adjacent to Salt Point State Park on the inland side of Highway One. Near milepost 43, turn onto Kruse Ranch Road. It’s paved at first, but in about a hundred yards, the pavement ends with a warning: “One lane road 1,000 feet ahead. 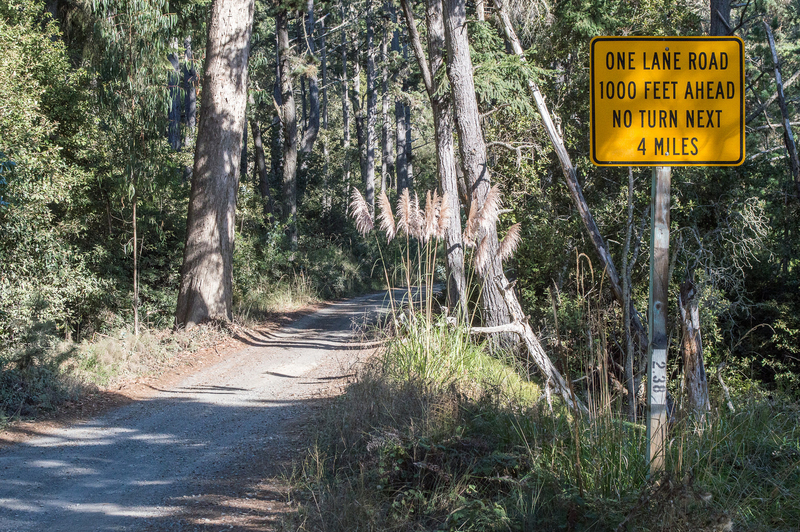 No turn next 4 miles.” If you’re in a passenger car, proceed the 1,000 feet or so to the preserve’s parking area. Buses and trailers not recommended. On California’s north coast, winters are mild and wet, with average temperatures in the low 40s. Cool and foggy summer days average about 64 degrees. Changes in weather are frequent. The reserve has no restrooms or trash receptacles. Pack it in; pack it out. Pets and bicycles are not permitted on the trails. Hikers should remain on trails so that young plants may flourish. Buses and trailers are not recommended as the narrow road has no turnaround space. 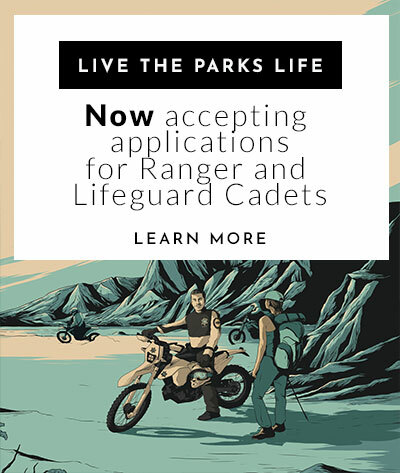 The Salt Point State Park brochure contains valuable information about Kruse Rhododendron’s natural and cultural history as well as tips for planning your visit. Take a drive or a quiet hike in a second-growth redwood forest. Roughly from mid-April to mid-June enjoy the added bonus of corsage-like clusters of pink rhododendrons on waxy-leaved shrubs. On the Rhododendron Loop, you can get a good look at the thickest stands in less than 10 minutes. You can also hike the Chinese Gulch/Phillips Gulch Loop (2 miles total) to dive deeper into the reserve’s botanical delights. If you have an hour, walk the Rhododendron Loop and as much of the Chinese Gulch Trail as you can. A wooden fence keeps the trail clear from a dense, sunlit stand of these beautiful shrubs. If you have half a day, walk the Rhododendron Loop and the Chinese Gulch and Phillips Gulch trails, for a total of 2.12 miles. Enjoy the hushed sounds and serene sights of the forest. Picnic beside one of the seasonal streams. The packed-dirt parking area is accessible. Some good rhododendron displays may be seen from the road, but it is one-lane and unpaved, with no turnaround for 4 miles after the parking area. Accessibility in state parks is continually improving. For updates, click the Accessible Features link at the top right of this page. Kruse Rhododendron State Natural Reserve is located approximately 20 miles north of Jenner on Highway One near milepost 43. It is adjacent to Salt Point State Park.